The lady who runs the place is always smiling and happy to help. She’s so lovely! The bedroom and showers were always spotless and the people staying were also nice. 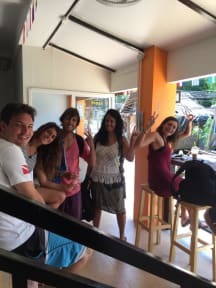 Small hostel, far from the crowded parties if you want a more relaxing sleep but still a few minutes to the beach. The room has 10 beds and 2 bathrooms with showers. Value of money is ok. We were lucky to sleep overnight with only us in the hostel, I guess it is low season now in April. We are staying 2 more nights. Very clean hostel and friendly staff. Would definitely stay here again.